TP Link Archer C5400 Tri-Band Router Configuration and setup with your home broadband internet connection. To enjoy seamless wifi connectivity and gaming experience TP-Link AC5400 is the best option. TP Link archer c5400 is a tri-band gaming router with inbuilt antivirus and print server features. TP-Link AC5400 having less with 8 inbuilt high-performance wireless antenna to make it a new age powerful wireless router. If you are a game lover and gaming is your hobby then, just Archer c5400 can be your best gaming router for 3D HD graphics experience. This router is fully secured and advance feature for different type requirements such as gaming, live streaming, surfing and much more. While using TP-Link AC5400 5334 Mbps wireless speed with gigabit interface to make your whole home WiFi enabled and enjoy the Netflix in any location. TP-Link Archer C5400 Tri Band high-end enterprise wireless router for high-speed internet and storage sharing. IT is not only a Wireless router but also a print server, network storage and Antivirus for your mobile, PC, laptops. AC5400 is the complete solution with supported cloud and VPN server to keep connected you other remote location always. 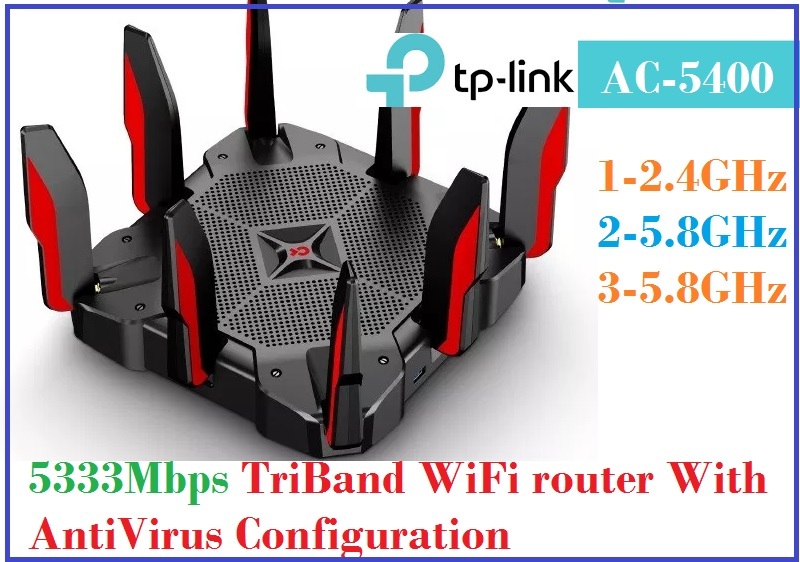 In this post, I am going to give you simple configuration manual for TP-Lin AC5400 Tri-band Wi-Fi router with enabling parental control and Antivirus protection. To configuration of c5400x physical connection required to access from Pc or laptop. Apart from it you can also use TP-Link Bluetooth apps to setup TPlink archer c5400x from Android and iPhone. C5400x router having 1 WAN port and 4 LAN port for PC/Desktop wired connection. Connect the internet cable coming from the modem to WAN port. Take another cable and connect any LAN port to PC/Desktop LAN port for configuration. Power on the router with DC socket and power adapter comes with router box and press power button as mention in the picture. 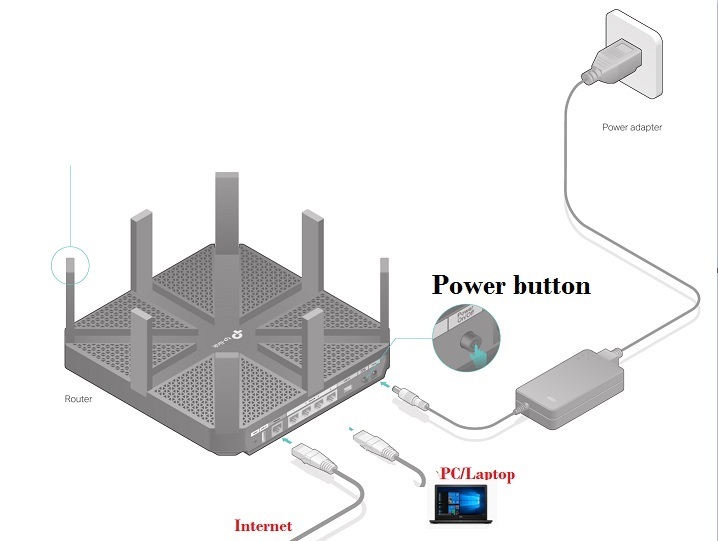 Turn your PC or Laptop LAN into DHCP or use the static IP address of default series of TP-Link default IP (192.168.0.1). EXP use the 192.168.0.10 in PC. Once you have connected your C5400 router to pc now login the Wireless router first time to the configuration. Open internet browser and type “http://tplinkwifi.net” hit the enter button. First time there is no password set on ac5400 so need to create login password on the first login. You will land on the status page where you can check Network Map and connected clients status with wireless status. The first step of configuration any router is the WAN configuration according to ISP settings. Internet Connection Type- PPPoE, Static, DHCP.. Choose the internet type of your ISP. If you internet run on PPPoE username password, choose the PPPoE. If your internet work on Static IP then uses the Static IP. After fill, all settings press save button to apply settings. 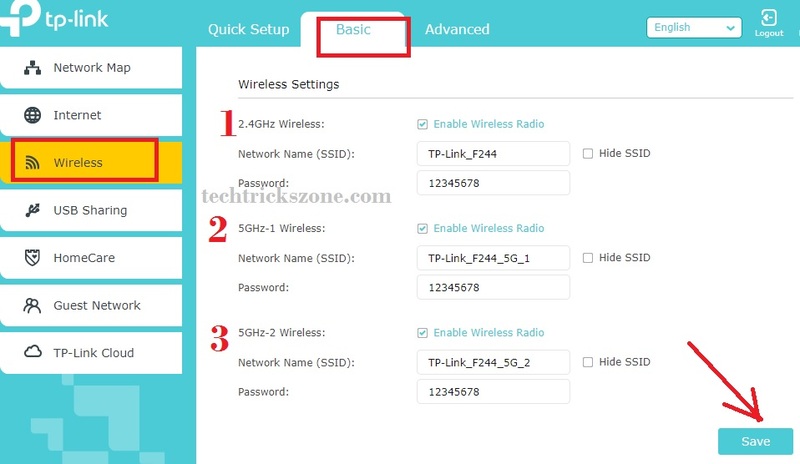 Wireless configuration is the most important part of configuration wifi router because it makes you protect and lack of the wrong configuration can be hack your network. To configuration Wireless SSID and WiFi password follow the steps. 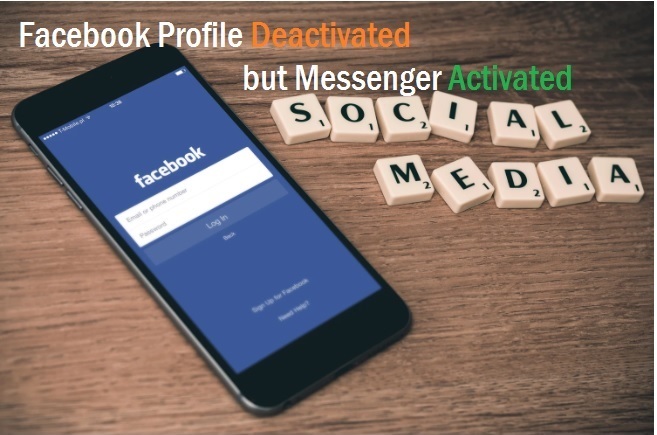 After all settings press save button apply changes. TPLink C5400 device support guest wifi access with captive portal login authentication to provide a secured way to access network. Enable this option if you want to give access guest to each other device. Enable this option if you want to make your network local network accessible from the guest device. Create WiFi name for Guest network with this option. 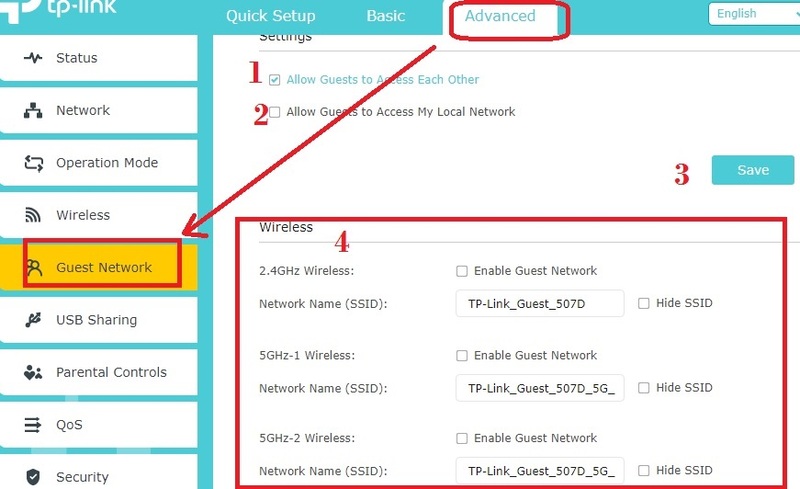 You can enable only single Wireless network for Guest from below bands. Do the same setting for 5.8GHz 1 and 2 network SSID if you wish to enable all network for guest access. How to Enable Captive Portal Authentication on TP-Link AC5400 WIFi router. TP-Link C5400 tri band router support captive portal as well as the direct authentication method for secure guest access. To enable captive portal authentication you can promote your business or product with guest network. See below to create your own captive portal authentication login page for TP-Link Wi-Fi router. Go to security option in guest network and choose the security method you want to create for guest Wi-Fi network. Using this option you can create internet plan based on hour 1 hour, 2 hour etc. You can customize and add your own company logo, homepage, and any product image to promote with guest network. Authentication Type: Simple Password or No authentication for unsecured Guest access. Set password for captive portal login for guest access. Set the time for guest network access as per guest requirement. 1hour, 2Hour, 3Hour or more from the list. Once time exceeds internet will stop for guest network. 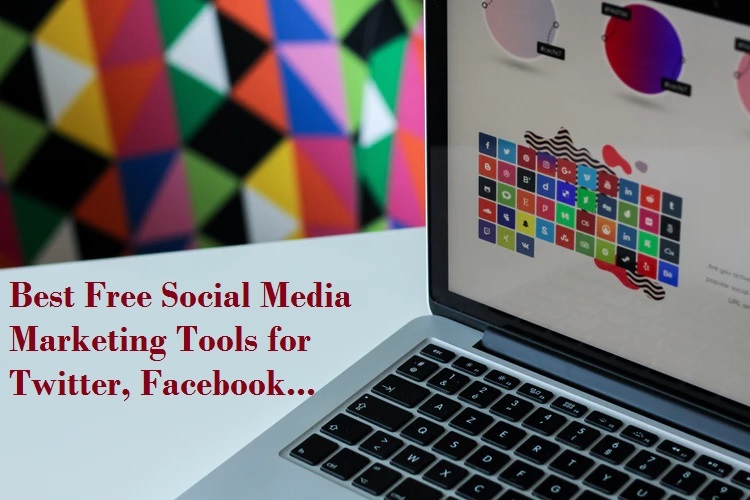 Click Edit button and add your company logo and product image to promote and advertisement purpose with guest wifi access. 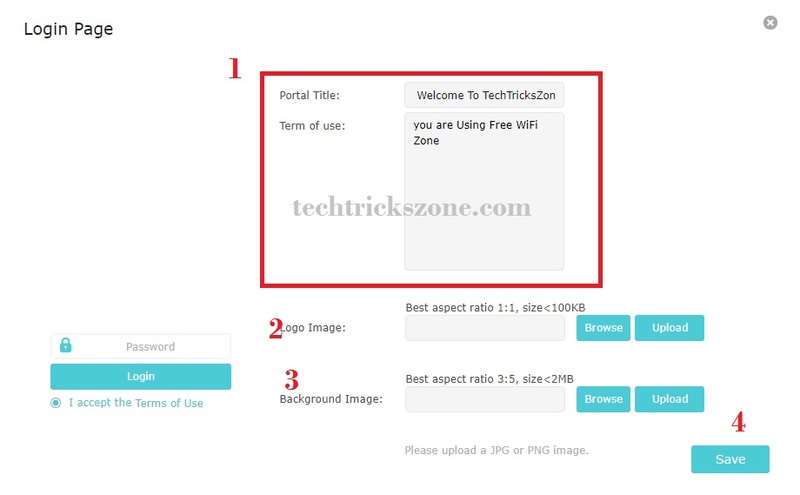 1: Portal title – add your company name or any message you want to display in login page for guest Wi-Fi. Tem of use: you can your term and condition in this box. 2: Logo Image: add your company logo using upload your brand logo in this option. 3: Background Image: You and product or any other image for background display in captive portal authentication page. 4: Save to confirm settings. If you want to enable Wifi password without captive portal than follow steps below. Press the Save button to apply settings. TP Link Archer C5400 Wireless best for commercial as well as home wifi purpose. IT is best and high-speed router for gaming and enjoying live streaming with excellent Wi-Fi coverage. The best thing is its complete solution for Wifi, network storage, antivirus for network protection and cloud access. You can enjoy seamless wifi experience without sitting in single place to bond with wired connection due to speed issue. enjoy the simple user manual for TP Link Archer C5400 Tri-Band Router Configuration and setup with your existing internet connection.